The branded video, three-plus minutes in length, has been viewed more than 6.8 million times and the accompanying online game app for the iPhone and iPad has been downloaded hundreds of thousands of times. 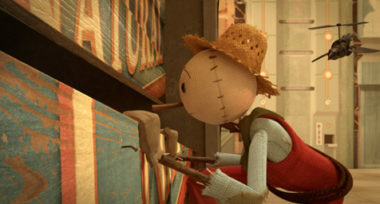 Dark and haunting and seen through the eyes of a sad scarecrow, the film shows a dystopian civilization where imaginary Crow Food Incorporated reigns. It’s a monolithic corporation where you find cows in confinement, assembly lines of processed beef, and chickens being injected with chemicals. The scarecrow returns to his farm defeated, but an uplifting turning point comes when he picks vegetables from his farm, brings them to the big city in his rusty pickup, and prepares fresh meals much to the delight of the city folk. According to the team at Moonbot Studios, the online game helps viewers understand the symbols, conflicts, and tension, elevating their understanding and experience. It challenges you to traverse the City of Plenty to rescue confined animals, bring crops back to fields, and serve farm-fresh food in PlentyFull Plaza, while dodging the threatening Crowbots. There are four worlds and levels, each with its own mini game. If you score at least three out of five stars in each of the games, you earn a coupon for free food at Chipotle. You know something has become part of the culture when people have created their own spoofs and spinoffs. One was produced and posted by the website Funny or Die, complete with a parody of the “Pure Imagination” song. Previous Chipotle ads and branded videos have included excellent covers performed by Karen O and Willie Nelson. According to USA Today, Chipotle will make another attempt at going viral when it releases four dark comedies online aimed at Big Food. Each production will be about the length of a TV show. To leverage the benefits of branded video and other non-traditional advertising, contact MDG Advertising today at 561-338-7797 or visit mdgadvertising.com.